The popular Canterberry Crossing neighborhood in Parker, Colorado is a family friendly neighborhood centered around the Black Bear Golf Course. Canterberry Crossing is located just three miles east of Parker’s historic downtown main street. The neighborhood sits in the hills on the east side of Parker which gives residents striking views of both the mountains and the city. Many homes offer these views right from their back deck. Other homes sit right on the golf course. Where ever you live in Canterberry Crossing, it’s easy to get out and enjoy the outdoors whether on the bike path or at one of the many parks. 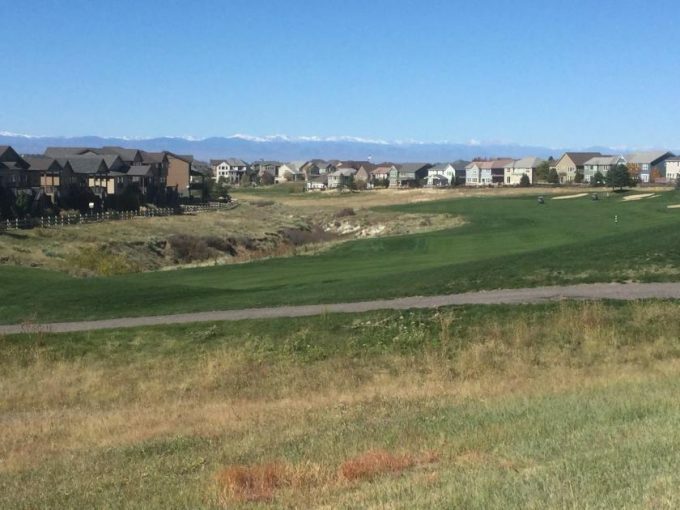 Buffaloberry Park, along Canterberry Parkway has tennis courts and offers sweeping views of the golf course and front range mountains. During the summer the neighborhood pool and clubhouse is a popular place for residents to gather and spend the day. The pool area includes a a spacious sun deck and baby pool for the little ones. Black Bear Golf Course, which winds through the neighborhood, is a private course which offers 18 holes. The championship course has over 200 feet in elevation change throughout the course and gives golfers a picturesque view of the mountains. Frontier Valley Elementary School sits in the heart of Canterberry Crossing. Many students are able to easily walk to and from school each day. Cimarron Middle School borders Canterberry Crossing and the Idyllwilde community. This school is still an easy walk for most children living within the neighborhood. Legend High School is just a bit further down the road from the middle school and still an fairly short walk for kids living on the southern end of Canterberry Crossing. These schools are part of the Douglas County School District which is one of the highest ranking districts in the state of Colorado. Homes in Canterberry Crossing vary greatly in price and size. Currently prices range from the mid 300’s to the 700’s. Many builders were involved in the development of the neighborhood which means there is a considerable amount of variety for homebuyers interested in the neighborhood. HOA fees vary within the neighborhood but are kept relatively low compared to some neighboring communities. If you are interested in moving to the Canterberry Crossing neighborhood, contact Courtney Murphy at 720-476-0370. Courtney Murphy is a Denver metro Realtor and Parker resident who lives in the Idyllwilde community which borders Canterberry Crossing.